It’s been a couple of days since our ship landed (as opposed to my ship coming in) and arriving in New York City by ocean liner is a rather extraordinary experience. Even more astounding is that I actually was able to wake up at 4am to catch the underside of the Verrazano Bridge as we glided below it, then slowing crept up on the softly glowing statue of liberty and all of Manhattan as it was waking up. 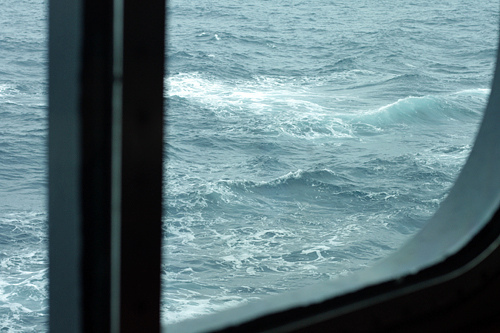 During the one week ocean crossing, the weather changed daily. In fact, it changed hourly. One morning it would be overcast and a little bleak, then an hour later, the sun would be shining and we’d all hit the deck of the ship and park ourselves in cushioned deck chairs and collectively gaze out over the ever-changing, sweeping waters of the Atlantic. This isn’t the kind of trip where everyone is waiting to arrive at a Mexican or at a port in the Caribbean, where hoards of people unload from the boat and invade a town filled with souvenir stands and margarita bars. People who take a transatlantic voyage are doing so for a purpose, which they’ve been doing for over a hundred years, and that’s to cross the ocean to get from one place to another. The only sightseeing is peering out over miles and miles of ocean. But of course, who wants to be somewhere for a week and not eat well? So I found myself eating fish & chips rather than stale chips & salsa. 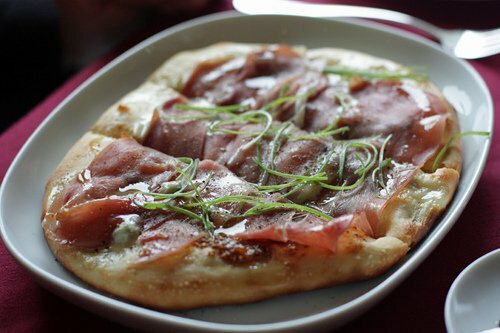 And warm fig, gorgonzola, and prosciutto flatbread. I was pretty surprised the first few days at how calm the ocean and ship were. I took another trip on the ocean once on a boat that had a stabilizer which vibrated the vessel constantly, and made everything creak a bit. I had a hard time sleeping because I felt like I was sleeping in a haunted house. This ship felt quite stable and things weren’t moving so much for the first few days. On day three, I awoke to the Queen Mary 2 rocking a bit more assertively. Things were rolling around and getting out of bed, I knew I was on the water. When I went to breakfast, a couple of people looked as though they would have rather have stayed in bed. I didn’t feel queasy, but did bring over-the-counter medication in case I did, which I didn’t need to take and the minimal swaying which lasted for just a few hours didn’t bother me. But for those who do feel like they need it, there are remedies on the ship, just in case. When you check into your room, you are assigned a room steward, who personally makes sure everything is okay during your voyage. To be honest, I was pleasantly surprised at the quality of the food. Of course, they’re cooking for well over a thousand people a day. But the menu changes with each meal and they seem to be happy to make allowances for allergies and intolerances. 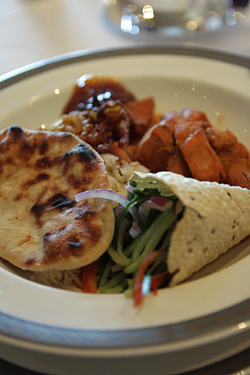 Plus there is a variety of ethnic foods to choose from, including Indian and Italian dishes. Also there are a few different levels of service you can choose from as a guest on the ship – the upper (“Grill”) levels mean you can eat in the more intimate dining rooms and have the same servers all week (which I had) although to be honest, I took breakfast in the main buffet since I’m not a fan of being waited on in the morning and am happier helping myself. And usually people are happier not to be around me first thing in the morning either. In spite of the fact that we could dine in the smaller dining room, we ended up eating a few times in the main restaurant of the ship, the Britttania, which was a multilevel restaurant and had the feeling of a vintage ship’s dining room, which was more bustling and fun. 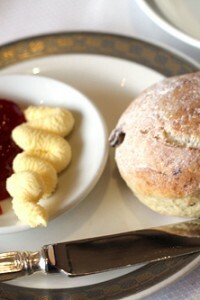 Afternoon tea is also included daily, as is room service, depending on your room. I felt pretty well-fed and did partake in tea (and scones) most days. For those concerned with their diets…or for those who eat too many scones mid-afternoon, there is a “spa” menu available at dinner and other meals. 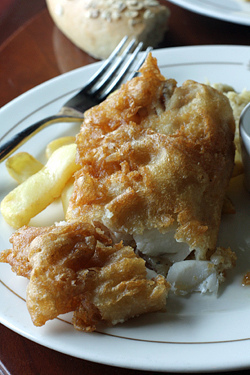 Pub fare is also represented and passengers can enjoy a pint and eat by the window, watching the ocean lulling outside, and snack on fish & chips or a Ploughman’s lunch. Chef Todd English has a restaurant on board which I ate at one night (there’s a small surcharge for eating there and the two photos above, and one below, are from his restaurant) and the food was copious and good, but I especially loved the “Truffled Potato Love Letters”, potato-stuffed ravioli with a generous amount of butter and Madiera glaze, although it was quite rich and I think I’ve just forgotten how filling American-sized portions are (either that, or I over-ordered), and it was hard to finish everything on my plate. Speaking of spas, Canyon Ranch runs the spa on the Queen Mary 2. There are plenty of treatments available in various price ranges. You can also pay something extra to get a day spa pass which allows you to use the co-ed hydrotherapy center with various steams rooms, whirlpools, and best of all – and my favorite – the relaxation room. I didn’t notice a single scuff on a wall or anything that wasn’t in tip-top shape on the ship. The multi-ethnic staff was friendly and professional without being intrusive. But if you wanted something (like directions around the ship, which I needed the first few days), there was someone nearby to point me in the right direction. Because the ocean liner travels from England to the United States often, there is a very British air to the boat and everyone on staff speaks excellent English. Liquor and wine aren’t included but I found the prices extremely fair. Cocktails started at around $6 and British beers were available on tap and in bottles. There were various cocktail bars on the boat and the two I liked the best were the Commodore Club (which has whiskey and martini-tastings), which had a few innovative cocktails (like a “molecular” Cosmopolitan with Cointreau mousse on top) and an extra-fruity Pimm’s Cup, and the Fizzless G & T, a mixture of gin, Lillet, orange bitters, and a few leaves of cilantro, which is now officially my favorite cocktail. But even better was the Chart Room, which had a fitting nautical theme and equally fitting bartenders, who were some of the friendliest people on board. There’s a movie theater and planetarium, and a computer center which offers free classes and was stocked with rows of iMacs for usage. 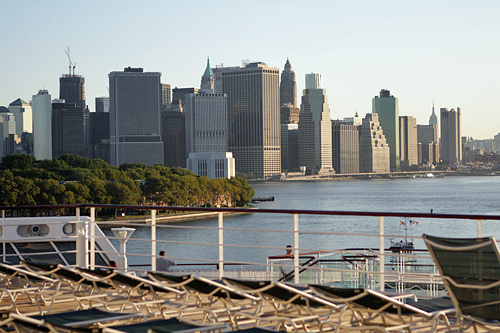 Satellite internet service on the ship is available at an additional charge. I am putting in a request for an on board espresso bar. So that was the crossing and I found the whole thing rather thrilling. And now I’m in New York City, having woken up before the sun to see the city in its early morning glory. The night before the Captain announced the chain of events for the next day and I woke up to the lights of a small boat circling our ship, presumably making sure we made it into the port smoothly, which we finally did just a few hours later. You had me at room steward. I want one too. 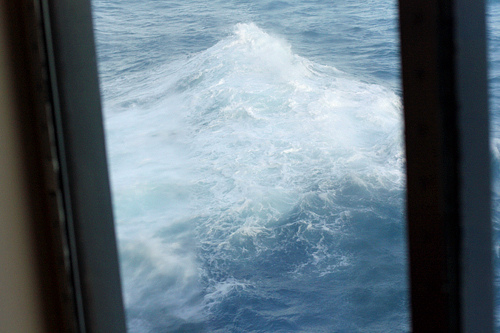 Love travelling by sea and I wish I could do it more often. I have never been on a major ocean-liner, small boats and sailboats have been it so far but I have had some friends that have gone recently and everyone seems to have a good time and they like the food. Thanks for writing about this. I am SOLD! Booking the next transatlantic trip on an ocean liner. And no jet lag! Hi David! What a stunning blog! I love New York! I’m delighted to have the opportunity to join you in your travels. You made that trip sound so awesome. My husband and I will be traveling to Kenya and since we will be there for one month. 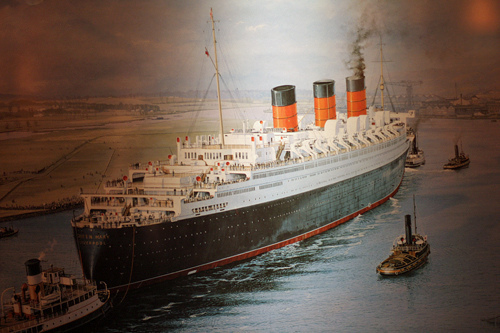 I am now considering taking this Oceanliner to Europe and then flying from there to Kenya. I’m assuming you’ll be flying home. If not and you’ll be sailing home….shop abundantly! Ouah I had no idea it was that reasonable and that beautiful. You made this trip look like a fairy tale and definitively great for people with time on their hands. Thanks for the reportage. Lovely! What a treat to accompany you in spirit. Thanks for taking us along. This Queen Mary series has been a true joy to read… thank you so much for bringing us along on your trip. I’m going to share these with a dear 83 year old lady who I know will really enjoy reading your posts… your writing, and your pictures are astounding, as always. So glad to have you stateside for a bit! Glad to read of your safe arrival in New York. Hope you and Romain have a swell time in America, and don’t forget to come back to Paris with a lot of Lipton Onion Soup! Your pictures from this crossing are really, really beautiful. And as an expat New Yorker I cannot help but be jealous of how special it must have been to arrive in the Big Apple at dawn on the Queen Mary. This really looks like an amazing way to travel, and certainly beats being cramped in a tiny airplane seat! The last time I went on any sort of cruise was when I was 12 and performing (dancing) there. Obviously the highlight of my trip was eating pizza at 3 AM, but I can see that the food has actually come a long way in the past 13 years. 13 years? Wow – I need to go on another cruise! Had never once considered traveling this way but I think it would be an incredible experience. Glad you arrived safely- your photos alone have probably convinced a lot of people to reconsider sea travel! we could get used to a room steward too…sounds like pure luxury. It was so nice to read about your boat journey, made us eager to do one too. How was it with changing timezones over the course of the week, every day an hour extra sleep? No jetag on arrival then? 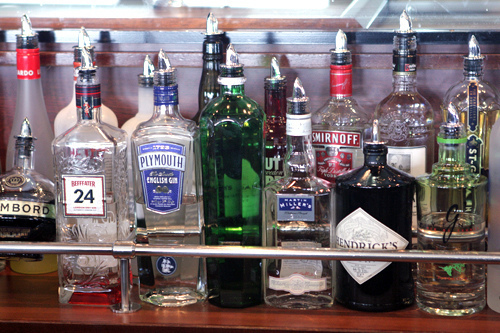 Sounds like you could have filled the week with trying every bar and restaurant on the ship, such a selection. Have a great time in New York! Wow. These posts have been just amazing. 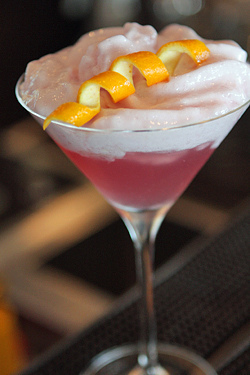 The food has looked great and those cocktails – yes please! This sounds like the most incredible experience! I can only imagine the awe and beauty in arriving on the water to a pre-dawn NYC…seeing that amazing skyline and watching the city wake up. Must have been quite something! 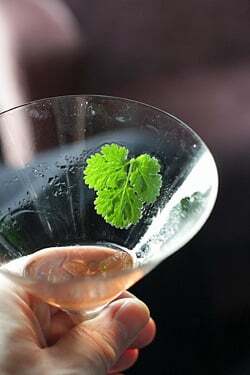 All the food photos are great too, and I am definitely going to try to replicate that fizzless G&T! well, you now have a few more people who envy you. And now you are in NYC too! May I ask how you stay in such good shape? Is it only yoga and bicycling, because I do yoga three times a week and ride 15km a day, but you look much fitter (and I am 10 yrs. younger!). NV NV NV! Have fun in the City. Beautiful…thanks for taking us – your readers – along with you. On the subject of airfare – have you checked out Open Skies? All buisness-class, and much lower fares. They only fly from Orly to DC or Newark, so they don’t work for everything, but the prices are good…And so is the legroom! Have a wonderful time in New York! . Hi Marie: I have taken Open Skies and I do like a lot about it – the better seats, the easier check in (and the special line to get through the checkpoint at De Gaulle), although the one time I took it, the food wasn’t anything special (it was similar to coach-class food) and the entertainment unit at my seat wasn’t working, nor were those of several others on the plane. It’s not the end of the world, but on a 8hr flight, it’s nice to have a working tv/movie system. If they flew to San Francisco though, I would likely take it going there. 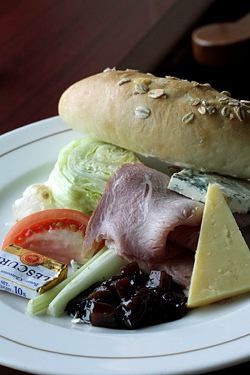 glad to see heaps of foods on my favorite cruise…! may be the trip was too wonderful for food lovers…! I was so trill so read about this trip. It looks fun. Of course, you need time, but if you have it, what an experience. New York city in early morning is so impressive. There is no noise (or at least less than later) and everything looks so calm. Last april, I went there and one morning, I woke up at 5 am… Even the Starbuks next to my hotel wasn’t open. I had to wait until 5:30.. When I entered there, nobody but me was there. Gradually, I saw people coming and ordered and as the time goes by, lots and lots of people were there. I think the peak was at 7:00 am… Thank you for your sharing, it reminds me good stuffs! Lovely post. I too have crossed the atlantic (albeit not on a ship as fancy as the QM2) and it truly is the trip of a life time. It was such wonderful and civilized way to travel – as well, it made me realize the full magnitude of the Atlantic Ocean! I wish ocean crossings would make a come back. Enjoy NYC. The luggage issue is an important one at times. When my brother moved from the US to the UK to join his wife, he was moving permanently, and had the requisite amount of stuff (I wouldn’t even call some of it luggage, it was crates and cardboard boxes). He ended up taking the QE2 on it’s second-to-last crossing for two reasons, (a) to do it, and (b) it ended up being significantly more affordable than any other way to get his half-a-household-of-stuff across the ocean. And Cunard was more than happy to do it. Some friends of mine moved their family back to the US from Europe and also found it more affordable to do it by boat. I think because ships like these ocean liners were originally (and primarily) used for people going abroad for longer periods of time, they are well-suited for transporting more items than people do by airplane. Ok, that has been added to the bucket list for sure! Thank you for the wonderful post. As usual, your photos make me feel like I am right there. 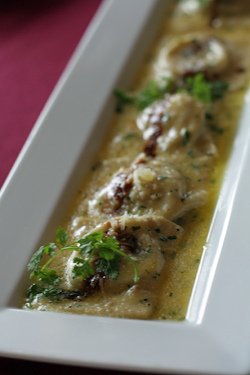 Potato stuffed ravioli? I think you mean pierogies. :) Love them–would like to try this version. Some day. Thanks, David! I’ve always said I would never do a cruise… Perhaps you are beginning to change my mind. The trip looks fantastic but I’m left wondering- what was the sense of time like on the boat? Were your days on the ship on British time? Was it easier to adjust to the time difference when traveling by boat since you had days to become acclimated? Was the voyage so amazing that the passage of time wasn’t even marked at all? When I was a kid my family moved from the US to the UK and then back after a number of years. We went over on the QE and back on the QE2. I never asked my parents why, but assume it was for reasons of practicality (a pared-down household of stuff) though I expect it was for the thrill also. I still remember sliding into NY Harbor under the Verrazano (which ends on the Brooklyn side in the neighborhood I was born in – an extra thrill) and past the Statue of Liberty. Thank you, David, for giving me something to dream about! Did you see Cary Grant on board? This looks like it was such an amazing experience. 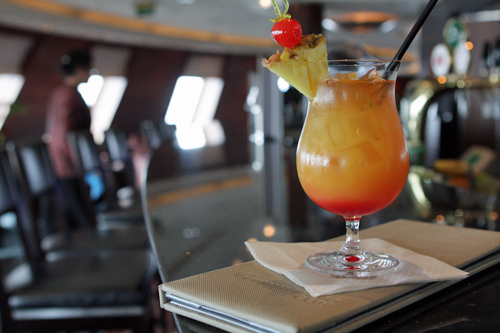 I can’t imagine anything more relaxing than a week at sea with good food, good drinks, and a spa! I also have a question about the time zones and change. How fast were you traveling through time zones? What “time” was it when you woke up every morning? Did they reset the ships clocks everyday? Almost every evening before bed, we were told to turn out clocks back one hour, which is how they compensate for the time zone changes. Like many European hotels, the rooms don’t have clocks in them (a representative for a major European chain once told me that Americans like to have clocks in their rooms, but Europeans don’t – but I don’t know about the British, even though they technically are European, too) but the clocks on board are reset with the changing time zones. Welcome to New York. What a thrill to take this trip. 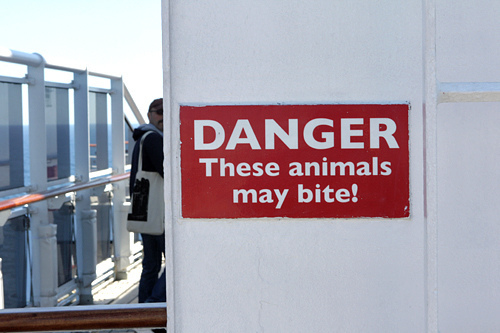 another lovely and informative post……..
Pets allowed! Really? That is the greatest news, I had completely given up Cruises since as far as I could tell no Cruise Line was pet friendly…… I will be doing some researching on exactly how that works. So sad that this portion of your blog has ended, awaited each entry! Thank you for sharing. 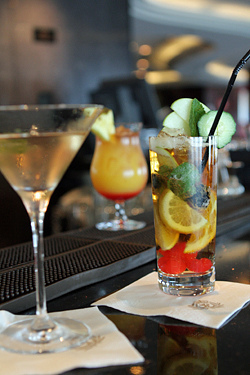 What about tipping – your personal steward for example. What about waiters at table. Tipping is obligatory. How expensive does it make the actual price of the ticket?? The price does really make you think about trying it. It makes the travel part of the trip! I turn my back for a little vacation, and you’re across the ocean!!! Are you coming to BlogHer or the west coast at all this trip? 1). 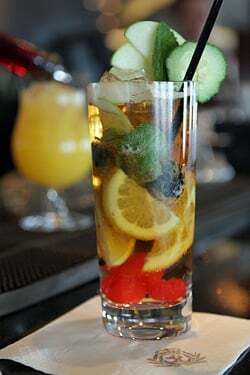 Is that fabulous tall glass drink a photo of the fruity Pimm’s? And, 2). How much did you end up spending on tipping the great staff? I’ve heard it can be as much as 50 percent of your ticket price? Looks like I should start saving my pennies! Great read – I really enjoyed the pictures and hope to take this trip at some point soon. 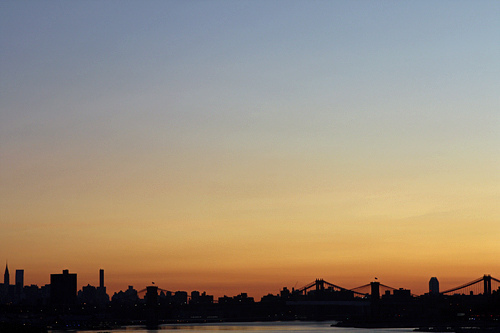 It’ll also be great to see your perspective of NYC – I live in South Williamsburg, in Brooklyn. I was wondering if during your NYC trip you have any seminars or book signings planned? I’ve been a longtime reader and would love to come out! Ah…perfect reading shipboard would have been David McCullough’s, The Greater Journey:Americans in Paris. The tales of ship travel in the 1830’s would have bouy you up – monthlong voyages and much tossing and turning. But a week free of Jet lag upon arrival is worth the price bien sur. Thanks for sharing your experiences David. I’m contemplating a move to Europe and was distressed about how I was going to move my two dogs. Now I see this is something to look forward to! David, since you are here I should bring you some salted caramel macarons!!! Glad you made it to port safely, NY first thing in the morning is magical. I love it. I could almost here the engines purr. I have loved these cruise entries. Thanks for posting . Thank you so much for sharing your wonderful trip on the Queen Mary. The pictures are beautiful and you look very relaxed in that deck chair, it suits you. Wow! I went on a cruise with a friend about a year ago to “test the waters” (pun intended) and swore I’d never go again. Your recent posts are making me reconsider. It sounds so elegant and relaxing. Thanks. Fun to read about your travels! I guess we’ll go when they add the espresso bar. compliments on the photos…they are lovely…what kind of camera do you have? have you taken any classes? I like your technique & skills. I use a Canon Rebel, which I really love. You can read more at My Food Photography gear, which has more info. Your trip reminds me of the pictures of Princess Grace crossing the Atlantic when she married Prince Ranier. So very chic. You had me at “relaxation room”….thanks for a wonderful journey ! I agree…espresso bar is a must ! I have been following every post regarding this trip – all brilliant as usual – and you have convinced me to move this type of crossing from the “would be nice someday” column to the “must do” column. Out of curiosity, did you find yourself more inspired or less inspired to write while on-board? There was plenty to write about, and to take pictures of (although I took too many photos and spent a little more time optimizing them for the web, which wasn’t as much fun) but it was really picturesque and I couldn’t help taking so many snaps! Wanderlusting about this journey. 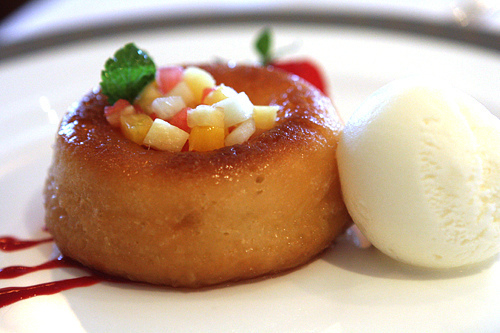 Tantalizing food, cocktails and ocean views! Welcome back to Manhattan, David ! Can’t believe it’s exactly a year since we saw you at Borders. My daughter and I are looking forward to seeing you at Babycakes. Hope we can all fit in there! Your posts on your crossing are so interesting. 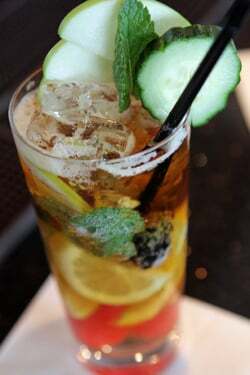 I’ve been thinking about Pimm’s Cup a lot. The ones in the pics look pretty healthy! Ha! How is it that living in Paris you have somehow become an upper class Englishman? I can just hear Charles Dance as Lord Rutherford icily informing Bob Balaban’s Mr. Weissman that an Englishman is never waited on at breakfast in the film Gossford Park. Really, it’s much more civilized. I have always hated being fussed over at breakfast, particularly by my mother. Thank you for your delightful post. I would love to travel abroad one day in the same manner. David, your ocean voyage sounds fricken awesome. You mentioned that you had to pay a little more to eat in Todd English’s restaurant on the ship, and it made me wonder if the other meals were included in the price of the ticket? All meals are included in the price, and there are a variety of restaurants to choose from. 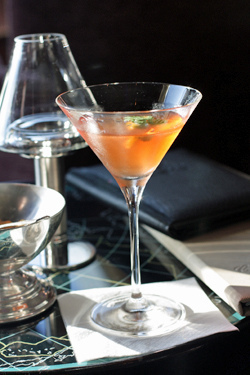 There are a few restaurants, like Todd English that require a small supplement ($10 to $35pp). I’m envious beyond words. 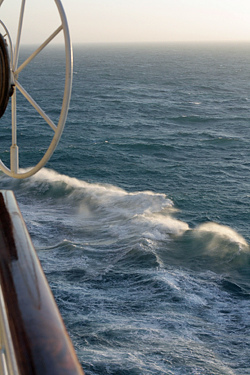 Your accounts of the classic transatlantic crossing have brought back memories from the past. My first transatlantic crossing was from Montreal to Liverpool on the Empress of Britain — as a young teenager, it was a worldly experience as our family crossed the Atlantic to visit relatives for the first time. The pampering and the extremely good food, the pace of life at sea, and the disconnect from the world are still vivid and pleasant memories. So it is good to hear that the classic crossing remains intact on the Queen Mary 2, with all the pampering and delectable delights which I fondly remember. Thank you for sharing your insights. You’ve sold me on a current trans atlantic boat trip. I like the idea of it as a leisurely, elegant mode of transportation rather than it being the journey-destination of a cruise. It is one, in it’s own way just not as obvious and frenzied as a cruise Slow travel with it’s potential for observing those temporary societial intrigues, as portrayed in novels, has always sort of made me want to travel by ship anyway. Did you happen to observe any on this journey? David, Welcome back to this side of the pond! 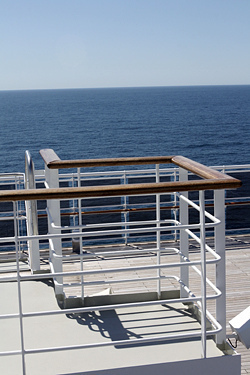 I really enjoyed your blog about the QM2 and your voyage over the Atlantic. Never been on a cruise, but I’m starting to think it’s a wonderful way to travel. Maybe someday. 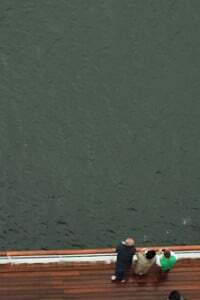 I crossed the ocean on the QE2 going the opposite way just before that ship was retired. So much that you wrote about and pictures you included reminded me of what a grand experience that was. At the end of the voyage we were given a choice of two day trips and when we docked at Le Havre, the day before arriving in London, we chose a tour of Normandy, the beaches,the American Cemetery and the French countryside. The tour was very moving and a fitting close to a wonderful week crossing the ocean on one of the grandest of the ladies. Thank you for your terrific blog, but especially the posts you made while crossing. They brought back some lovely memories. I’ve been reading and loving you for years, but never comment. There must be millions of us quiet DL readers on the planet. I’ve been to Spain, Ireland, Switzerland and now across the ocean with you. Although several of my, and my partner’s family have taken cruises, and love them to pieces, I’ve never been the least bit interested in being stuck on a boat – until now. Now I can actually imagine myself giving the QM2 a try one day. Maybe I’ll see you there! Sincere thank you for the crossing posts and their beautiful accompanying photos. I have gained a spate of goals – room steward, spa day, fizzless G&T. And at the end, Paris! Thanks for sharing this absolutely interesting travel experience. I love your photos as well as the descriptions – it seems giving a very good impression on the Queen Mary 2, the facilities, service, food and drinks! Looking forward to reading some stories about what you see, live and taste in the US. I heard that whoopies are absolutely trendy there, can you confirm on that? Have a good time! 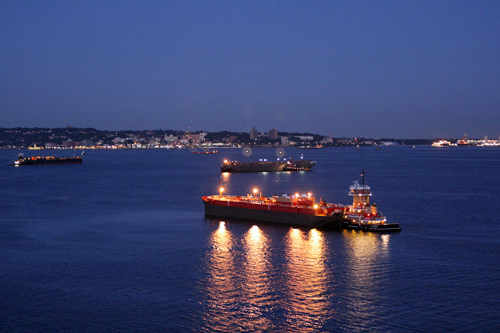 This is near and dear to my heart as I lived several years on the Hudson, and many mornings I would watch the cruise ships glide silently into the Harbor. 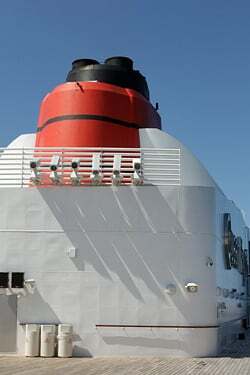 The Eastbound crossing we did on the QE2 was much fun but QM2 has it beat hands down. Imagine that I could bring my dogs with me on a crossing the next time we go to France! btw QE2 used to have piles of crystallized ginger at the entrance to the restaurants, said to be a natural cure for seasickness; wonder if it is still used. Hi David…glad you landed, but I will certainly miss the blogs from the QM2. 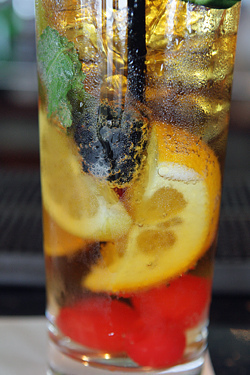 You made me cry (again) with those pics of the Pimms Cup. They are so yummy, and I never add all the fruit and veg the bartenders do !! Of course, it Canada it is easy to get the Pimms, but the trick is to get the right lemonade to mix with it. Thanks again for your blogs…. David, thanks so much for an overview of your cruise. 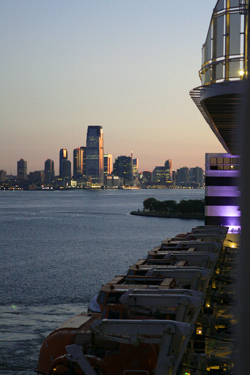 Last September we left NYC by cruise ship. Passing by the Statue of Liberty and sailing pass the skyline (this was about 5:00 in the afternoon) and under the Verranzanno (sp.) Bridge was a thrilling expereince. We had alot of patriotic feelings. We had our trip ahead of us and a glass of Champagne in our hand. It was a special moment. How did you feel coming back to the states after living overseas? I just finished The Sweet Life in Paris – loved it. Thanks for a great vicarious experience. Cruises are my favorite form of vacation, and the “at sea” days are my most favorite so I would love to do a trans-Atlantic crossing sometime. I’ve really enjoyed reading your posts over the past week or so, it looks like you had a marvelous time! These posts bring back great memories! I moved back from Europe to North America on the Queen Mary II with my husband and 3 dogs in 2008. It was an amazing experience, although perhaps a little less so for the dogs. They were very happy to see a patch of grass again after a week. 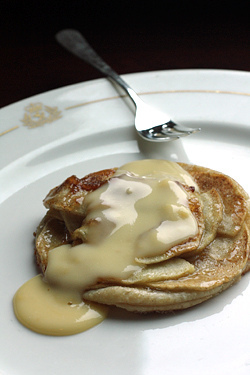 On the upside, they did dine on steak, potatoes, gravy, bacon & eggs for an entire week! Welcome to NYC! My friends George -and William took the QM2 from NY to England last summer, and loved it. And I loved getting a postcard from the voyage. In Manhattan, one of my favorite hole in the wall ethnic restaurants is Cafe Himalaya, 78 East 1 St between 1Ave and Ave A. It describes itself as Tibetan/Nepali, with very different dishes from the one Tibetan restaurant I know in Paris. 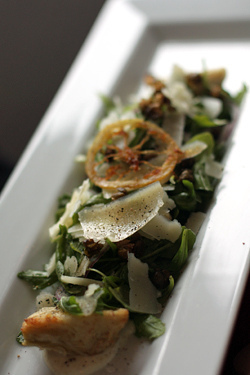 ….if you feel an urge for spicy sauces, cold salads and unusual curry. About a mile uptown is my favorite outdoor market for fruits, vegs, baked goods, plants, honey, even locally produced cider and wine, at Union Square park, betWeen 14 and 17 Street, at University Place (4ave). 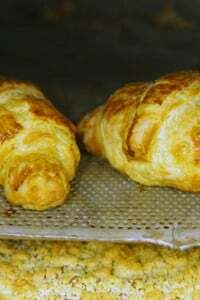 It’s open Mon, Weds, Fri, Sat, with different vendors. Thank you for sharing this trip. I just placed it on my bucket list. 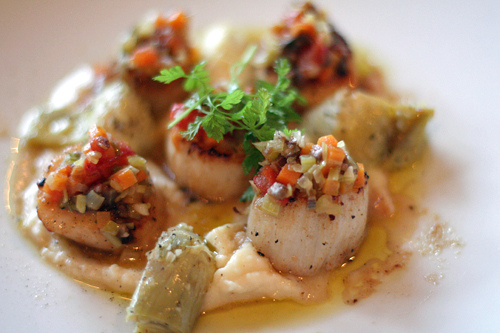 Now that you are in New York, where are you going to eat first? Motorino, ABC Kitchen, ChikaLicious, il laboratorio del gelato… the options are endless. Thank you for taking us along on your voyage. I thoroughly enjoyed reading about your travels across the ocean. So calming, a real break from the busy world. I took my first and only cruise at the age of 10, on a ship where you dressed for dinner, there were operators manning the elevators and miles and miles for red velvet carpeting. Until now I have been so turned off to the idea of a cruise by today’s floating shopping malls with such excessive drinking you read about someone going over board with regularity. I’d love to surprise my husband with a trip like this some day. This makes me want to go to Europe and return home at a leisurely pace ~ This is going on my bucket list! After that stunning review…..you should travel on the Queen GRATIS ‘FOREVER’!!!!!!!!! Sailed the Queen Mary from New York through New England to Nova Scotia and back for the Fall Colors. Amazing trip! You did a great job of capturing the spirit of an Atlantic Crossing and the majesty of this great ship. Bon Voyage again and again and again. I think there is an espresso bar next to the computer room! They do think of everything. While you were happily crossing the Atlantic I was happily lounging at a lake house in the Finger Lakes region of New York State reading (and thoroughly enjoying) The Sweet Life in Paris in between vineyard visits. Had no internet access so I’m just catching up. Frankly, never been interested in taking a “cruise”, captured audience and all that…may have to rethink that after reading this. Reading you is so much fun! I’ve really enjoyed reading about your adventure on the QM2. It sounds like you were very relaxed. I think I could “hear” it in your voice. 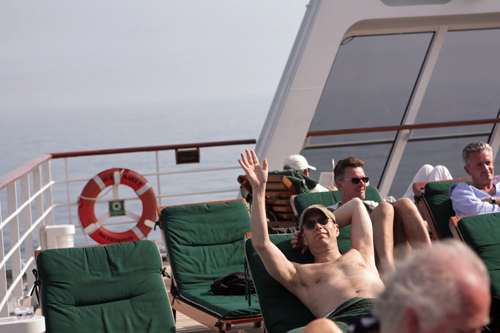 It’s hard not to be relaxed when making a TransAtlantic crossing. I did it once, a few years ago — from Rome to Baltimore. I was living the high life, treating myself to a suite and all that goes with it. It was the perfect vacation to relax, attempt to work on a book I’d been writing for a couple of years and do nothing but stare out at the sea and skies once we’d left the Mediterranean. p.s. the book is still nowhere near finished. 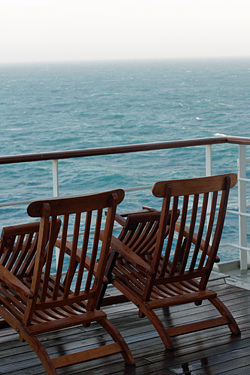 Maybe it’s time for another cruise — this time on the Queen Mary 2? I was in Manhattan from the fourth until the thirteenth. What an insane city it is around that time. I hope you can get into the restaurants – Off the top of my head I don’t have any recommendations because I deliberately winged it instead of planning or reserving ahead, but I’d actually recommend that method, if anything. When I was a little girl, my parents were South African diplomats stationed first in Stockholm, where I was born, and then in Paris. We used to travel back and forth via a Union Castle ship and some of my earliest memories were on board. Later I traveled to Japan from Hong Kong via Korea and Taiwan on a merchant marine ship that had two passenger cabins. I live in France en plein année now, but for fifteen years I moved back and forth between France and New York. I also cannot bare the idea of more trans-Atlantic flights, but you are tempting me with the idea of going at least one way by ship. Thanks for your piece. 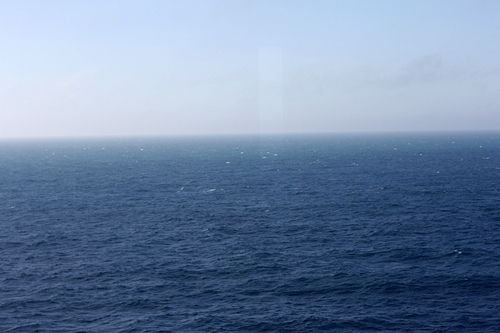 I’m adding a trans-Atlantic cruise to my bucket list after reading your blog. I’m terrified of deep sea water, but your photos and blog calmed my nerves and I hope to overcome my fear and cross it off my to do list in life! Thank you for the inspiration! What a great trip. This must have been a unique experience. I feel like I just took a vacation. Thank you David. I suppose you saw the same things my grandfather saw on the ship he took when he came to this country. The fish and chips look divine! But I rather expected better looking food on a liner. Did you? Most of it looks so,…gray. Ahhhh but, lucky dawg you, you get to eat in New York! It has been a pleasure reading about your passage David. Thank you for sharing, I hope to go one day. Wow! Looks like such an amazing experience. Were there many children on the cruise?